Firmware Update is a free, monthly-ish newsletter by embedded systems expert Michael Barr. Firmware Update is a trademark and this issue is Copyright © 2018. You may forward whole issues to colleagues that design embedded systems. No other uses are permitted. "Rule 1.7.c: The goto keyword shall not be used." We haven't heard complaints that this rule is too strict. However, the MISRA-C guidelines are a bit more relaxed about goto. Thus I’ve been reconsidering this rule for an update of the BARR-C standard, a goal of which is to make rules from the two popular standards even easier to pair. To get the 2018 update published later this month, I need to finalize this rule. If you've got a few minutes to consider the best arguments for and against the existing ban, I'd appreciate your input. When it comes to memory, embedded systems engineers face many challenges. 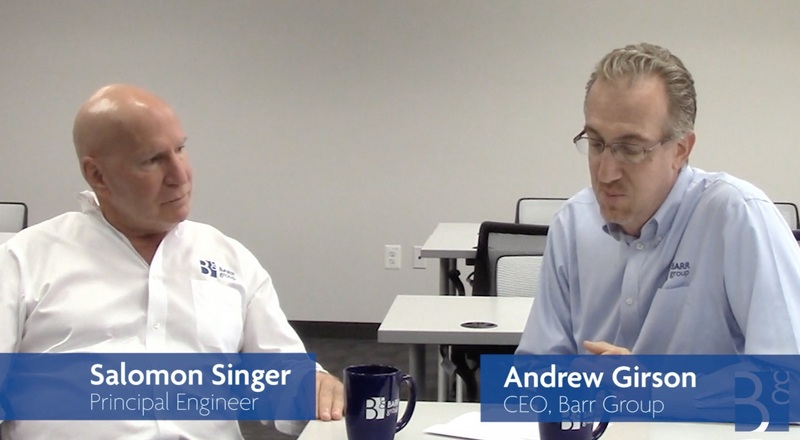 In this month's Tech Talk, Barr Group's principal engineer Salomon Singer chats with CEO Andrew Girson about some of these challenges, including how and when to use heap memory (i.e., dynamic memory allocation) in firmware. Is your embedded systems design project falling behind schedule? Staffed with experienced embedded hardware and firmware engineers, Barr Group provides embedded systems design assistance and expert guidance to engineering teams and their managers. Need temporary staff augmentation? Struggling to find specific expertise? Need help with development tool configuration? Want an independent design/code review? You can see how we've helped some other companies reach their design goals here: https://barrgroup.com/case-studies. What's stressing you right now?